Some of my favorite childhood memories are from summer days at the beach. Squawking seagulls, rolling waves, ice cream men ringing their bells from the bulkhead, and lifeguard whistles comprised the soundtrack of my summers growing up. It may sound rather cliché, but through the craziness of my early 20s, I always found comfort in living – and raising my son – in the same place that held so many good memories for me. 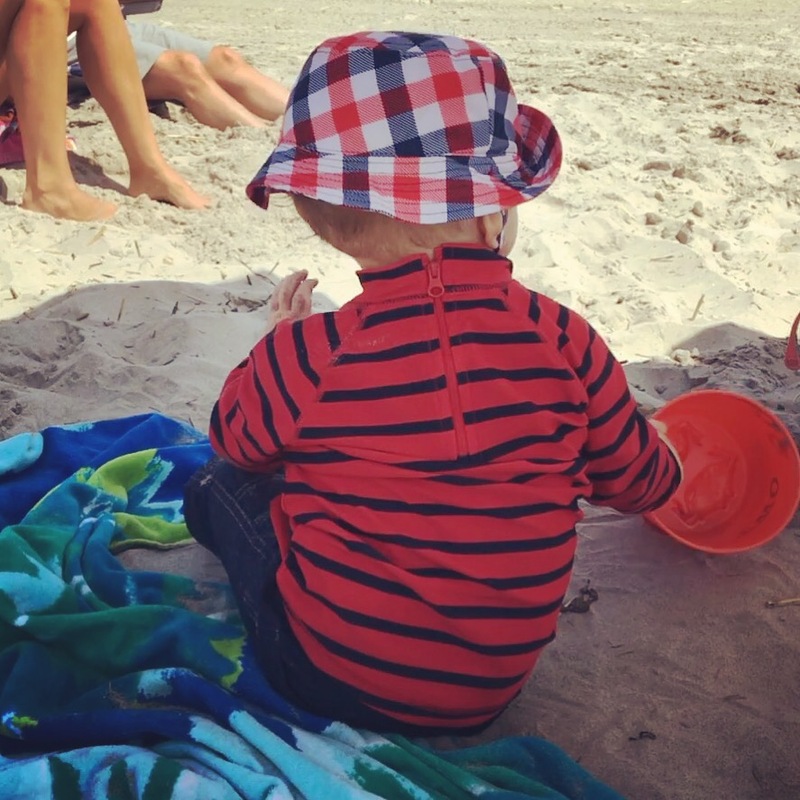 Each time I wiggled my toes in the sand, it took me back to a simpler time. Whenever I read the opening paragraph of Chapter 1 from The Other Side of Later, I get a little pang of nostalgia. The first two sentences aren’t just true for Julia; they’re a direct reflection of my childhood as well. What’s funny is that I wrote The Other Side of Later before I had Baby D so I had no clue I would have a son someday as this opening paragraph came to life on my laptop screen. Now, the last part of the paragraph also rings true for me. I’m so happy I get to raise my son in the same place that holds so many great memories from my childhood. As the summer goes on, I plan to share other little tidbits about The Other Side of Later and the places that provided me inspiration. I hope you enjoy reading about them, and I hope you’ll check out The Other Side of Later on Amazon. 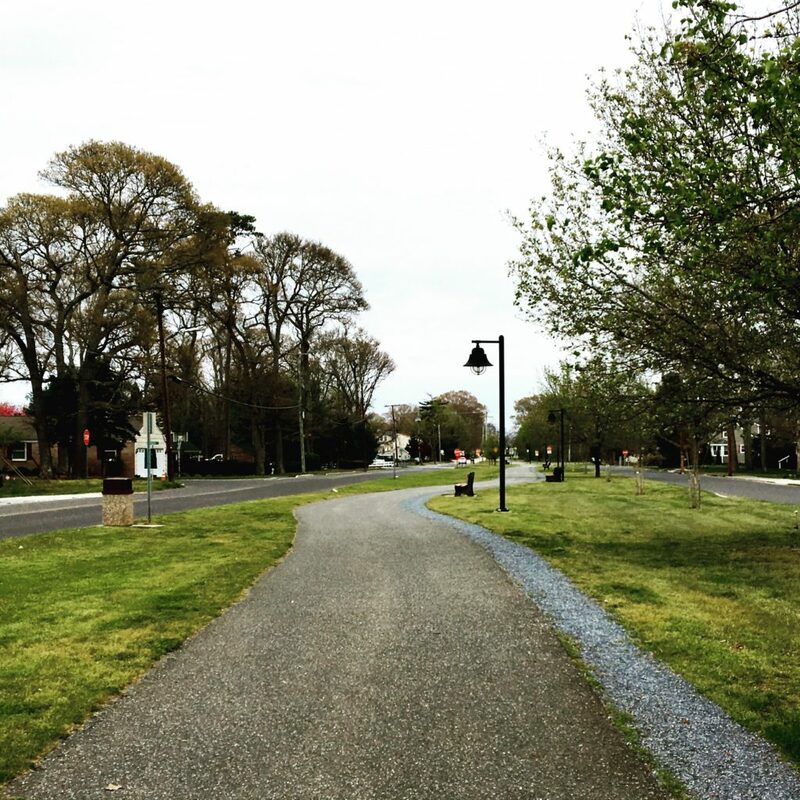 If you follow me on Instagram or Twitter, you probably know that along with writing I love to run. It’s a break from the hustle and bustle of everyday life. Most days, I have a goal in mind – a certain distance, a particular pace. But some days, it’s not about the miles or the time on my watch; it’s about the road in front of me and the peace of mind I get in return. So it goes without saying that one of my favorite passages to write in The Other Side of Later was the running scene in Chapter 3. Julia runs through Sea Grass on a familiar route. As she tries to ease the tension of her workday, she relishes in the memories she finds along the path. Like Julia, each time I lace up my sneakers and go for a run up and down the same streets I have since high school, I feel comfort. There’s a normalcy that keeps me grounded. I hope you enjoy this excerpt from Chapter 3 of The Other Side of Later. My sneakers ran on automatic pilot down a familiar path on Oak Street towards Veterans Park. After college, Aaron and I settled in my small hometown, whose Jersey Shore charm is undeniable while its name — Sea Grass— is unoriginal at best. Years ago, before the town became a suburb of Atlantic City, a majority of the area along the bay was covered with sea grass. As the story goes, fishermen, who used the area for crabbing, would refer to the track of land as Sea Grass. Through the years, as more people settled in the vicinity, the name stuck. While the name may have seemed generic and like any other small shore town, there were memories down every street and around every corner. Oak, the main street through town, appropriately name for the tall oaks that lined both sides, hosted the annual Memorial Day and Fourth of July parades. Each summer the bay front properties line with shops and restaurants were invaded by tourists or shoebies as us permanent Jersey Shore residents called them. This was home to me. The late August humidity was oppressive. The air felt heavy. It was like a snowsuit clung to my legs with every stride. As I reached the bike path surrounding the park, the sun disappeared behind clouds rolling in from the west. The shade was a welcome change and helped take my mind off of the heat so I could enjoy the peacefulness of the park. I felt the built up tension from work gradually disappear as I hit my stride. I was about halfway around the loop when I felt a large drop of rain hit my forehead. I closed my eyes for a moment and hoped that I imagined it. As three more large drops hit my face and arms, I knew it wasn’t my imagination so I quickened my pace in an effort to beat the worst of the storm. I was over a mile away from my house so as the rumble of thunder got louder, I realized it would be a losing battle. Within seconds, I was in the middle of a complete downpour. Multiple lightning strikes illuminated the darkened sky so I sprinted towards the gazebo in the center of the park. Please check out The Other Side of Later on Amazon! Do you remember the moment that changed your life? Every so often I like to give a sneak peek of The Other Side of Later. Today, I’m sharing the prologue. I hope you enjoy it! Do you remember the moment that changed your life? You know, the one you think back on from time to time and know without doubt it was a turning point. It’s funny because so many times, it seems like such an ordinary moment. It can happen anywhere in the blink of an eye. Sitting in class, walking through the supermarket, driving through town on an all too familiar path. Everyday occurrences change into life altering situations. I was in college. It was my junior year at Belpark University – a small liberal arts school just south of Philadelphia. I remember it like it was yesterday. The sky was blue; the air was brisk. It was a beautiful October day. Leaves were changing colors, and the temperatures were finally cool enough to drink a latte on my way to class without working up a sweat. The coffee bar in the lobby of Centennial Hall, the second home for Belpark business majors, added pumpkin muffins to their pastry selection and the aroma permeated the air as I stepped into the building. I was in a little bit of a rush, but I knew I’d have to buy one before the end of the day. Database Systems was a core course for marketing information systems majors. While I was a marketing major, not MIS, I had still opted to take a few electives to broaden my skill base. “Yeah, I think so.” I replied as I tossed my coffee cup in the nearby trashcan. As I rounded the corner on my way to Dr. Meade’s office, I hit something and I hit it hard. Unable to catch my balance, I stumbled backward and landed on the floor. The folder with my proposal as well as my agenda datebook and notebook flew out of my arms and papers went flying all over the hallway. I looked around to survey the extent of my paper spill before looking up to meet my human roadblock – Aaron Morgan. Aaron was a senior finance major. I had never actually met him before, but Belpark was a small school and the College of Business even smaller so most upperclassmen were familiar faces. However, Aaron wasn’t just a senior finance major. He was the guy every girl at Belpark talked about. He was at the top of his class coming off an internship at one of Philadelphia’s top financial companies in addition to being a two year captain of the crew team and vice president of the College of Business honor society. When that was coupled with his 6’2” stature, crystal blue eyes, and golden tan, he was quite the catch, and most definitely, not the guy I wanted to act like a complete klutz in front of. “Julia?” I heard as I came out of my daze. “It is Julia, right?” Aaron said to me as he knelt down and started to pick up my scattered papers. I couldn’t figure out how he knew my name. After a pause I let continue for way too long, I finally replied. “Yes, I’m—I’m sorry for all this.” I said as I started to get up and pick up my papers. “I need to watch where I’m going.” I was so embarrassed. It was bad enough to run into someone and have papers go flying, but did it have to be Aaron Morgan? This was how I was going to meet him? It couldn’t be a causal conversation by the punch bowl at the upper classmen social scheduled for the following week? Or maybe at the College of Business football game tailgate? Or even in the basement of a frat house when we were both slightly inebriated? It had to be like this. “Are you okay?” He asked with genuine concern. We continued to gather the papers. “I think we got it all.” He said as he handed me a large pile of papers. “Thank you.” I replied without looking up praying that I could just get my papers together and somehow make the embarrassing situation disappear. “I should have watched where I was going too. I’m sorry I knocked you over.” He extended his hand down to me. “Alright then. Have a good one, Julia.” He said as he briefly touched my arm and continued down the hall. Later that day, I was in line at the small coffee bar getting my pumpkin muffin when I heard him call my name. “Julia?” Unlike our first meeting that day, I saw Aaron coming towards me before we met face to face. I looked down and shook my head. “You really don’t need to apologize. I should have looked where I was going. I was in a rush.” I said with a smile and turned from the counter to leave. “Finished for the day?” He asked. I nodded. “Yeah, my classes are done.” I replied. I looked up at him. “Sure.” I replied, and that was the four letter word that most definitely twisted the fate of my life. As embarrassed as I had been hours earlier, I was equally relaxed as we settled into a conversation that lasted long after we finished the mediocre bistro wraps and lukewarm minestrone soup, which were the food court specials that evening. Classes, family, high school – we talked about anything and everything. Afterwards, he walked me to my apartment, and the following night, we went on our first official date. At first, I was the typical starry eyed girl completely enthralled by his good looks and undeniable charm. But after a while, almost everything about my life was about Aaron. I didn’t think of possibilities that didn’t include him; I didn’t do the independent research study second semester junior year; I also didn’t study abroad in London the first semester of my senior year. My life was consumed by him. I thought he was perfect, and over time, I convinced myself I couldn’t find better, or if I could, that guy wouldn’t want me. So instead of running in the opposite direction after so many red flags, I created my own fairy tale. Two days before my graduation, he surprised me with a trip to New York City and proposed in our hotel suite overlooking Times Square. The story made my friends swoon, and to be honest, my heart skipped a beat every time I told it. I was caught up in a world of flowers, cakes, invitations, and dress fittings. The wedding I dreamed of since I was a little girl came to life. Everything was perfect, and I even convinced myself the groom was too. But once the flowers died, the cake eaten, invitations discarded, and the dress worn, the reality of my not so perfect groom came to light. 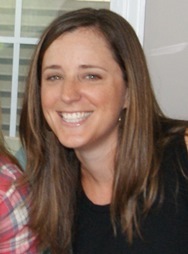 Two years later at 25, I was pregnant and alone. If you enjoyed the prologue, please check out The Other Side of Later on Amazon! Spring at the Jersey Shore! It seems like everyone has their favorite season, but my favorite thing of all is the change of seasons! Whether it’s the chill in the air in the fall or the first hint of a warm breeze in the spring, my excitement builds with the transition to a new season. As the weather changes and the calendar flips to a new month, there are always things to look forward to. The past week (with the exception of today…it’s such a rainy afternoon) has been absolutely beautiful at the Jersey Shore. Spring certainly has finally sprung! 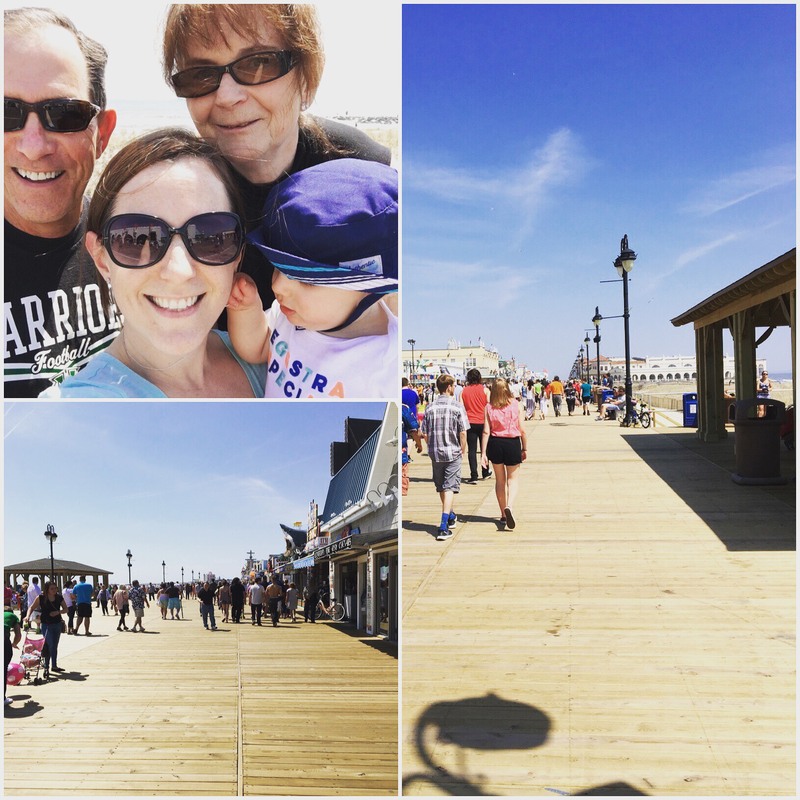 Yesterday, my parents, Baby D, and I (my husband took a much needed nap after being up with a teething Baby D all night) took a walk on the Ocean City boardwalk, and it almost felt like summer! The sun was warm, the waves were crashing, and the seagulls were squawking. The sweet salt air and sounds of amusement rides got me so excited for the upcoming season. The warmer months is when my little corner of New Jersey really comes alive. Bayfests, boardwalk vendors, ice cream stands, long days on the beach…..so much fun! My goal is to share glimpses of my summer with you, and maybe entice you to put the Jersey Shore – the place, not the TV show – on your travel bucket list! I make it no secret that I love my hometown area, and the setting for The Other Side of Later reflects that. The streets, the park, the businesses are based upon places that have a very special place in my heart. The Shellfish, where Julia and Drew have their first date, is no different. The Shellfish represents the restaurant I hope everyone has. It’s the place you and friends head to catch up; it’s the place you and your spouse (or significant other) go for date night; it’s the place with familiar faces – even it’s not familiar names – whenever you walk in. 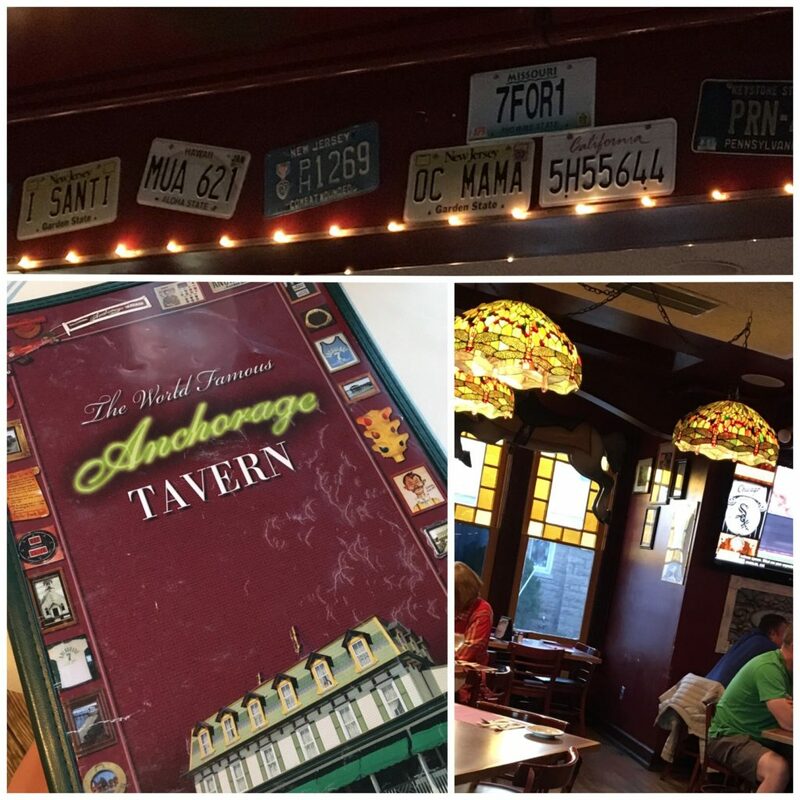 My Shellfish is The Anchorage Tavern. It’s familiar and it’s one of the many places that make this area my home. I hope you enjoy this excerpt from The Other Side of Later about The Shellfish. The Shellfish was only a five minute drive from my house. It had been a local landmark and watering hole for generations. The building was built in the mid-1800s, and as the story goes, it transitioned from a hotel to a tavern over time, survived prohibition, and kept going strong ever since. While most restaurants along the bay became inundated with tourists during the summer months, the Shellfish almost always remained a local crowd. Summer nights saw the bar packed with not only the baby-faced 21 year olds, but also the old familiar faces of the baby-boomer era. Everybody drank; everybody danced; everybody was friends. The building itself was a spectacular site. Its four story Victorian structure with a large wrap around porch overlooking the bay was unique among the smaller shops and restaurants. Inside, I would always see the same several faces seated at their designated stools at the bar. I didn’t frequent the Shellfish enough for everyone to know my name, but it was always a familiar scene. I hope you enjoyed the excerpt. If you’d like to read more, please check out The Other Side of Later on Amazon. Happy 4th of July! 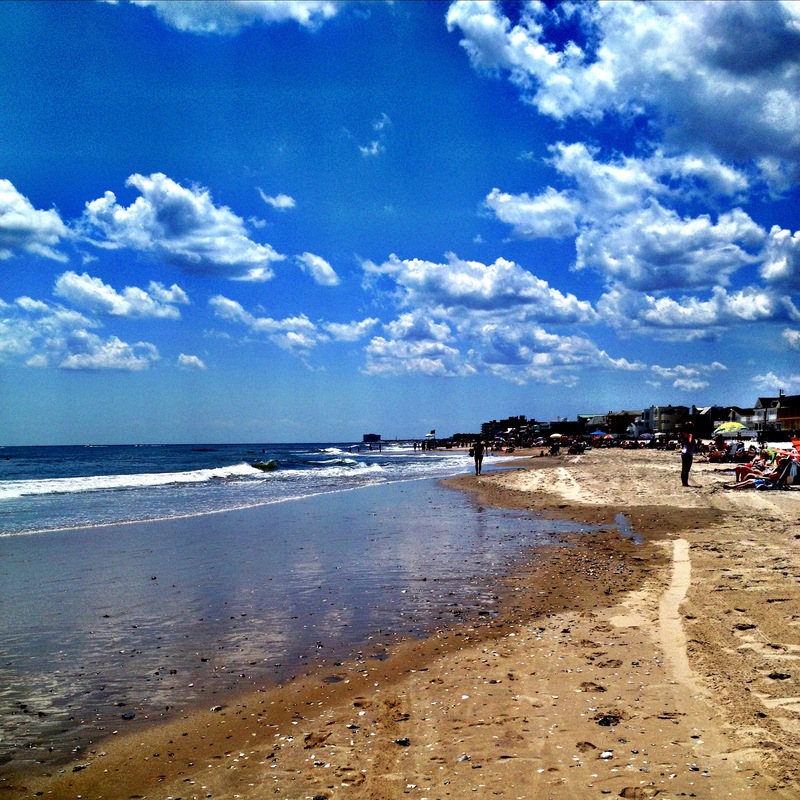 Here at the Jersey Shore, Independence Day always signals that summer is in full swing. The area is full of tourists – aka shoebies as us locals call them, days are warm and long, and beach days are plentiful. The opening paragraph of Chapter 1 of The Other Side of Later always gives me a pang of nostalgia when I reread it. 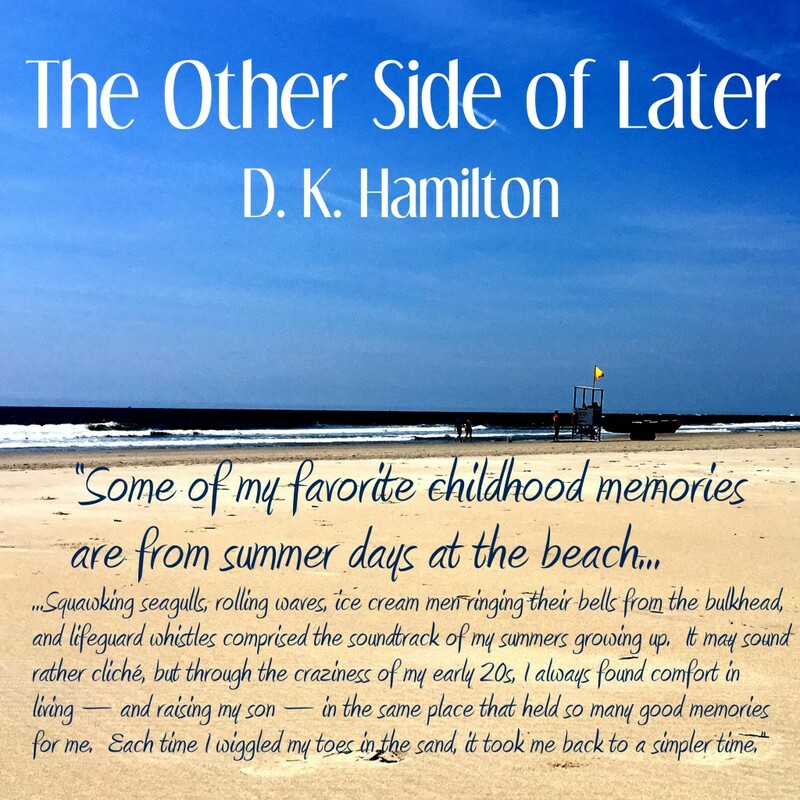 If you’re looking for another book to add to your summer reading list, check out The Other Side of Later on Amazon for only 99 cents! The Other Side of Later is free today on Amazon. Since it’s free until midnight, I’m sharing the prologue. I hope you enjoy this sneak peek and check it out on Amazon! Who else is excited for warmer days, brilliant sunshine, and spring weather? After a little tease of spring back in March, the past few chilly weeks have had me wishing for warmer weather. When the weather gets warmer, I always start thinking about which books I’m going to toss in my beach bag or load on my Kindle for late spring and eventually summer days on the beach. 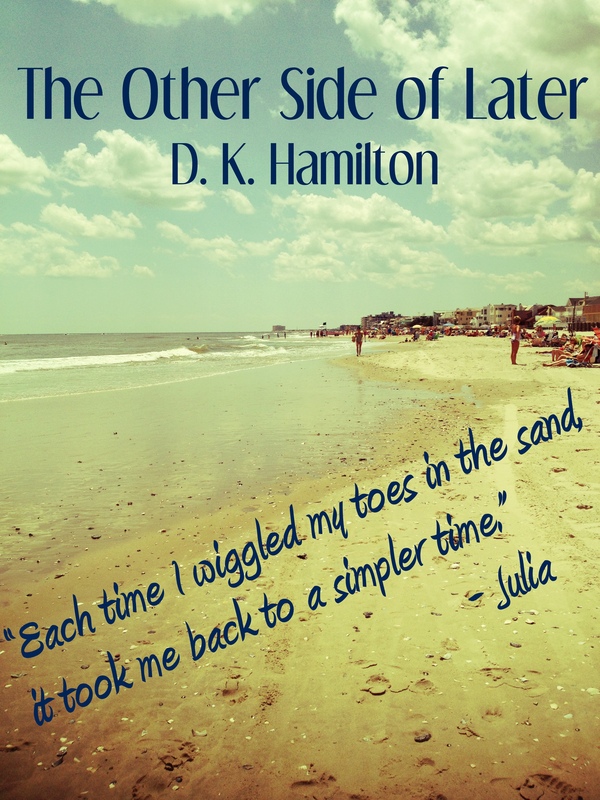 As I’ve mentioned before, The Other Side of Later is set in a small town at the Jersey Shore, where the beach is a part of life. I hope you enjoy this sneak peek! When my brother, Luke, and I were really young, weekends were family days at the beach. Our parents, grandparents, neighbors – Mr. and Mrs. Johnson – and their children all congregated at the 17th Street beach by noon and we didn’t dream of rinsing off and packing up until well past 5. We ate my mom’s peanut butter and jelly sandwiches, learned to body surf in the ocean with my dad, sat on our grandmother’s lap to get some much needed shade under her umbrella, and somehow, without fail, persuaded my grandfather to dig us a big hole to play in. As we got older, summer jobs and social lives changed the routine. Our work schedules didn’t always allow us to be at the beach on the weekends. We didn’t dig holes and I certainly didn’t body surf once I graduated from one piece suits to bikinis. Instead of my mom’s peanut butter sandwiches, my friends and I would walk to Loretta’s, the neighborhood diner, for lunch, and breaks from the sun were few and far between as we took turns paddling away from shore in the Johnsons’ ocean kayaks. The activities changed, but seagulls still squawked, waves still crashed against the sand, ice cream men still ran their bells, and the lifeguards still blew their whistles. The sounds were exactly the same each time I climbed the steps over the bulkhead and onto the beach. The Other Side of Later is available on Amazon for only 99¢!